Ah, fresh herbs. So fragrant! So delicious! Everyone loves to garnish pasta with ribbons of basil, and fresh mint leaves with chocolate ice cream is beyond yummy. Use these handy scissors to season homemade pesto, sauces or salsas, or for adding that special taste to your next salad or made-from-scratch dressing. To ensure that cutting, chopping and mincing those flavorful herbs is swift and simple, try using FreshSnips Gourmet Herb Scissors. 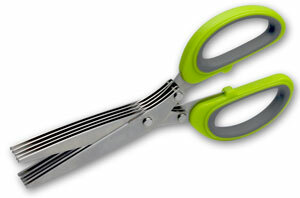 These clever scissors are an essential tool for any cook who wants to maximize the punch of fresh herbs in their cooking. Featuring five heavy-duty, stainless-steel blades, FreshSnips Gourmet Herb Scissors cut garden herbs quickly and evenly without crushing them. You have to admit, garnishing your food with fresh herbs is "shear" joy.